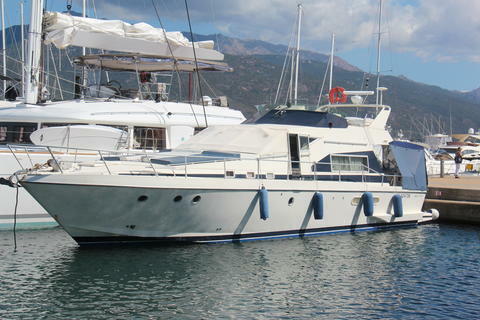 Boat in excellent condition, with attention to technical details and finishes; reliable navigation thanks to the excellent workmanship with excellent materials and top quality components. Total refitting in 2013: deck, hull and superstructure gelcoat polishing, steel polishing, inspection and replacement of all on board electrical systems and navigation support systems (plotter, radar, GPS and 15 inch. touch screen). Complete maintenance and servicing of engines. All battery packs replaced (services / engines). Power generator replaced with a brand new 11Kw Koeler (zero hours of use). striped mahogany) are, in fact, both in excellent condition.